Two main qualities give the Aprilia Atlantic an advantage over its rivals - its stable and predictable handling, and its relatively low price. The surefootedness it has round corners is down primarily to its large, by scooter standards anyway, front wheel. The fifteen-inch, alloy five-spoker gives the Atlantic a more conventional motorcycle feel. It’s a virtue which immediately became apparent just pootling around the gravel car park at the launch venue’s hotel. And instead of feeling like the front end would instantly tuck under if it lost grip, as most scooters do, the Aprilia gave the impression it would slide much more gracefully and give you a chance to save it. That untypical, but welcome margin for error made itself obvious later, out on some very slippery roads. It was a feature that I and my skin were more than thankful for. But the real plus point of the Atlantic is its price. At £4,720 on the road, the Aprilia is significantly cheaper than its Japanese rivals, the Yamaha T-max 500 and Honda Silver Wing 600. Both cost in excess of £6,000. Price is always an important consideration when buying any two-wheeler and the Atlantic has a significant head start with buyers. The ride round some very demanding roads on Sicily also proved that not only is it cheaper to buy, but offers just as much value for money as its competition. It’s a good looker, with similar lines and shapes to its sports-touring big brother, the Futura. 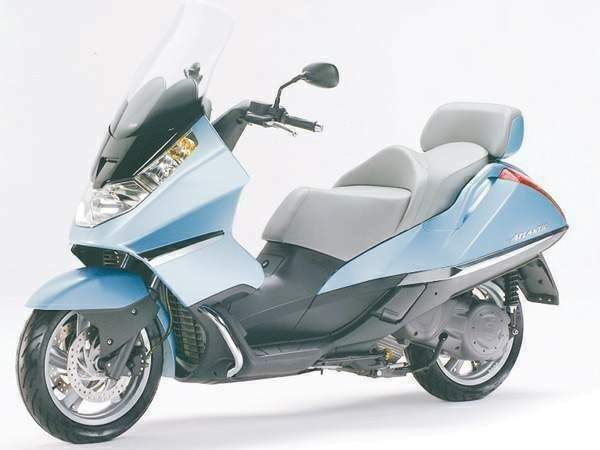 It also has plenty of features to make it a practical, go anywhere, anytime, machine. There’s plenty of protection from the fairing and screen. 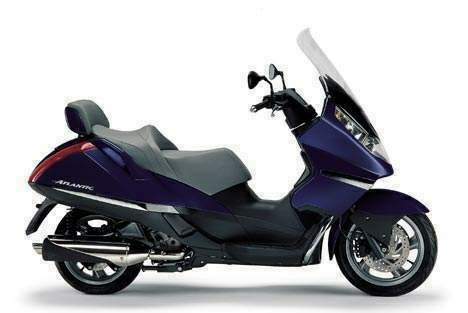 Though in the chilly weather that greeted us at the start of the test, the plastic didn’t prove to be quite as good at fending off the elements as the Honda Silver Wing. 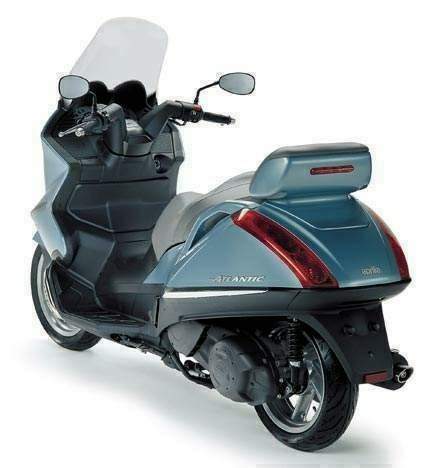 But the plush seat, and very relaxed upright riding position make it suitable for any length of journey, and more than a match for any other super-scoot. Though it’s worth noting you can’t adopt the more reclined feet-forward stance as you can on most others. And that’s simply because there’s simply not enough room on the footboards to stretch your legs. In fairness, though that might be a bit unusual, I never found it a problem. There’s little to criticise the engine for either. The 460cc single cylinder fuel-injected motor, supplied by Piaggio, is the same one that’s fitted to the rival firm’s ill-fated X9 (recalled due to handling problems), with an Aprilia-spec airbox, exhaust and fuel-injection mapping. It’s a cracking engine which runs very smoothly, has bags of punch, and zips from a standstill at a right old rate. There’s very little lag when you twist the throttle, as the centrifugal clutch bites promptly and smoothly - a feature that’s particularly important when you’re manoeuvring at very slow speeds. In fact, feet-up U-turns feel easier and more composed on the Atlantic than they do on many other scoots. There’s no rolling on this ship, despite the Aprilia looking a tad big and bulky. That same sense of poise possesses the Atlantic, even when going a bit faster, thanks mainly to the stiff, steel-tubed trellis frame, long wheelbase, and ( shock horror ) a steering damper, keeping things nicely on track - even when the Atlantic’s flat out. Keep the throttle pinned and you’re soon up to a very decent pace. Cruising at around 85mph is easily possible. Tuck in a bit you’ll see a maximum of around 100mph registered on the analogue speedo. The rest of the instrumentation is very comprehensive. There’s a fuel gauge and rev counter, two trip meters, and a digital readout which records average and highest speeds, ambient temperature, fuel consumption, battery charging rate, and a ‘service due’ indicator. There’s also a clock, and even a lap timer! Fuel consumption ranges from 34mpg if you’re caning it, to an impressive 72mpg when you’re cruising along at just 60mph. And with a bigger than normal tank size of 16 liters , the Atlantic’s fuel range is between 120-250 miles. That’s a hell of a lot longer than any of the other super-scoots, and a very welcome feature. Being able to ride the Atlantic over longer distances means you’ll inevitably be tempted to sample it on some backroads like I did. And after the fun I had on it around Sicily’s twists and turns, I’d recommend that you give one a go too if ever you get the chance. Stable handling with great feel for what the scoot’s actually doing into and round corners soon encourages a bit of lunacy. It’s a big bus by scooter standards, but chucking it about is still pretty easy. The linked brakes are OK, and will haul the Aprilia up sharpish, but you must give the levers a big squeeze to be sure of stopping on time. Aprilia’s technical men say they’re going to fit different pads for sharper initial bite on the production models. That should be all that’s needed for them be fully up for the job. And while they’re at it, they should also fit the parking brake, which they’re considering. My bike fell over twice when I parked it on an incline, as there’s nothing to hold it in position. No such attention is needed to the suspension. It’s stiff enough to allow sporty riding, and the rear shocks in particular do a very credible job as they have to control the very heavy unsprung weight of the engine, which in true scooter fashion forms the swingarm. The impressive control the forks and shocks give is another reason why the Atlantic can feel so settled thrashing along ‘proper’ roads. But it has to be said, if a really smooth ride is crucial, you won’t appreciate the firm suspension settings so much. Creatures of comfort will be thankful for the generous pillion carrying capacity, complete with large grab handles. They’ll also like the underseat luggage space, which is big enough for a full face helmet after a bit of juggling. An aftermarket top box is available if you need more space. Up front there’s a slim glove compartment, big enough for stuff like documents and a packet of Marlboros. More room would be needed here to praise the Atlantic fully. But, and it’s a fairly big but, there’s still a bit of doubt about the scooter’s sales chances in the UK. The Atlantic is a great scooter. But the fact that it’s a scooter and not a ‘real bike’ will put some off. And though the price is a lot lower than the opposition, it’ll still be considered a bit too steep by most riders. On the other hand though, depending on its success, even if that turns out to be only in Europe, I can still see even bigger, automatic scoots coming to us in the very near future. I’d predict that happening within just two or so years. A new side to biking is about to unfurl. How big it gets over here is down to us Brit bikers recognising its benefits. Ride an Atlantic and you’ll see the light.